Pacific Coachways in Garden Grove, Calif., takes pride in its ability to provide great customer service – so much so that when they hire drivers, they value personality over previous experience. Due to this practice, Pacific Coachways has a loyal staff. Some drivers have been at the company for more than 15 years, according to Giddens. Pacific Coachways maintains a School Pupil Activity Bus (SPAB) certification, which requires an annual California Highway Patrol (CHP) inspection and allows them to carry California school children. Giddens says SPAB certification is vital to the company, which does a lot of business with local districts. The operation requires all of its drivers to be SPAB-certified, whether they will drive a school bus or not. The program requires 20 hours of behind-the-wheel training and another 20 hours in a classroom, as well as a test given by the CHP. To maintain the certification, drivers must receive 10 hours of reoccurring training every year. “We also have bi-monthly safety meetings, where all the drivers come and we do classroom training with them,” Giddens adds. In addition, if any driver has an accident, they will undergo mandatory refresher training within a few days of the incident, which focuses on that driver’s problem area. 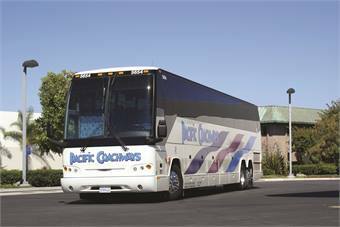 Pacific Coachways’ driver training helped the operator win the CHP’s Annual STAR Award in both 2010 and 2012. The award is given to operators that hold exemplary safety records. Pacific Coachways has held 28 consecutive satisfactory reviews from the CHP over its 21 years in operation — and received another four glowing reviews this year, according to Giddens. They were also the California Bus Association’s 2011 operator of the year. Pacific Coachways also enforces driver safety through the use of DriveCam, which captures risky driver behavior. The operator installed the devices on its motorcoaches five years ago and saw an immediate improvement, Giddens says. When it comes to finding customers, Pacific Coachways recently shifted its focus to online marketing. Also important to the operator is its commitment to the motorcoach community. Giddens and his father Tom — president of Pacific Coachways — regularly participate in industry events, sit on a number of boards and attend trade shows. In fact, without the involvement of Tom Giddens — who was, at the time, president of the California Bus Association — California’s party bus law might have gone unchallenged, creating expensive and potentially detrimental requirements for charter operators across the state.